Original Editors - Maggie Kraemer from Bellarmine University's Pathophysiology of Complex Patient Problems project. 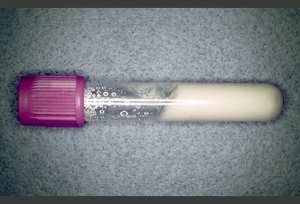 Arthrocentesis and synovial fluid analysis: should be performed upon initial presentation. Positive results include: identification of needle shaped bifringent urate crystals that are engulfed by phagocytes or free floating ; 2,000 - 100,000 WBCs/uL with over half of the WBCs as polymorphonuclear. 24 hour urate excretion: normal is 600-900 mg. This may help identify hyper production of uric acid or decreased excretion. Primary hyperuricemia is an inherited form of the disorder. Idiopathic hyperuricemia does not have a known cause. Prevention of recurrance - Daily low doses of NSAIDs or Cholcicine are commonly used to prevent recurrent attacks. Correction and prevention of hyperuricemia - Uricosuric drugs or allopurinol may be used alone or in conjunction. Hypouricemic therapy may also be used for patients with tophi and a higher recurrance rate. Dietary restriction of high-purine foods is a less effective treatment technique but is still recommended. Carbohydrate restrictions may also be helpful. Other treatment possibilties include hydration greater than 3 liters per day. Alkalinization of urine, extracorporeal shock wave lithotripsy, and surgical excision may also be beneficial. The physical therapist should be aware that any patient with a history of gout, hyperuricemia, and/or a septic joint presentation should be refered for medical evaluation prior to treatment. 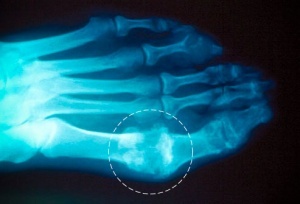 Pseudogout - a form of arthritis that occurs 1/8th as often as gout. Symptoms are very similar to gout; however, the knee joint is primarily affected. Diagnosis is made by aspiration of synovial fluid. Functional Characterization of Clinically-Relevant Rare Variants in ABCG2 Identified in a Gout and Hyperuricemia Cohort. ↑ 1.00 1.01 1.02 1.03 1.04 1.05 1.06 1.07 1.08 1.09 1.10 1.11 1.12 1.13 1.14 1.15 1.16 1.17 1.18 1.19 1.20 1.21 1.22 1.23 1.24 1.25 1.26 1.27 1.28 1.29 1.30 1.31 1.32 1.33 1.34 1.35 1.36 Goodman CC, Fuller KS. Pathology: Implications for the Physical Therapist. 3rd ed. Saint Louis, MO: Saunders; 2009. ↑ 2.00 2.01 2.02 2.03 2.04 2.05 2.06 2.07 2.08 2.09 2.10 2.11 2.12 2.13 2.14 2.15 2.16 2.17 2.18 2.19 2.20 2.21 2.22 2.23 2.24 2.25 2.26 2.27 2.28 2.29 2.30 2.31 2.32 2.33 2.34 2.35 2.36 2.37 Beers MH, et. al. eds. The Merck Manual of Diagnosis and Therapy. 18th ed. Whitehouse Station, NJ: Merck Research Laboratories; 2006. ↑ 3.00 3.01 3.02 3.03 3.04 3.05 3.06 3.07 3.08 3.09 3.10 3.11 3.12 3.13 3.14 3.15 3.16 3.17 3.18 3.19 3.20 3.21 3.22 Goodman C, Snyder T. Differential Diagnosis for Physical Therapists: Screening for Referral. St. Louis, Missouri: Saunders Elsevier, 2007. ↑ 8.0 8.1 Gout. National Institute of Arthritis and Musculoskeletal and Skin Diseases. 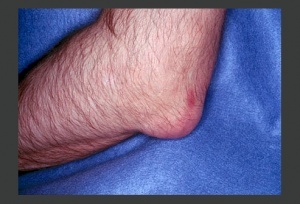 December 2006. http://www.niams.nih.gov/Health_Info/Gout/default.asp. Accessed March 2010. ↑ Wheeless, C R. Pseudogout and Chondrocalcinosis. Wheeless' Textbook of Orthopaedics. November 2008. www.wheelessonline.com/image9/cppd2.jpg. Accessed March 2010. ↑ Lagier R, Gee W M. Spondylodiscal erosions due to gout: anatomicoradiological study of a case. Annals of the Rheumatic Diseases. 1983 June; 42(3): 350-353. ↑ Dhoble A, Balakrishnan V, Smith R. Chronic tophaceous gout presenting as acute arthritis during an acute illness: a case report. Cases Journal. 2008; 1: 238. ↑ Sano K, et. al. Atypical Triggering at the Wrist due to Intratendinous Infiltration of Tophaceous Gout. Springer Hand. 2009 March; 4(1): 78-80. ↑ Ma L, Cranney A, and Holroyd-Leduc J. 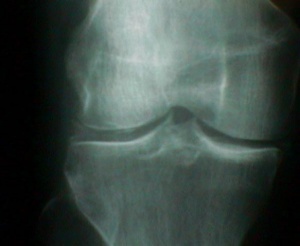 Acute monoarthritis: What is the cause of my patient's painful swollen joint. CMAJ. 2009 January; 180(1): 59-65. ↑ Morris I, Varughese G, and Mattingly P. Colchicine in acute gout. BMJ. 2003 November; 327(7426): 1275-1276.